The diagnosis for either disease is made based on clinical examination, x-rays, and lab tests. You will be asked questions about your symptoms and how the disease has affected your activities. Because medications and other diseases can cause gout and CPPD, you will be asked to provide a detailed medical history and an accurate medication list. A detailed examination of your hands is important as the clinical appearance helps to clarify the type of arthritis. X-rays are also helpful. Calcifications within the wrist in the region of a ligament called the triangular fibrocartilage complex (TFCC) are classic for CPPD. 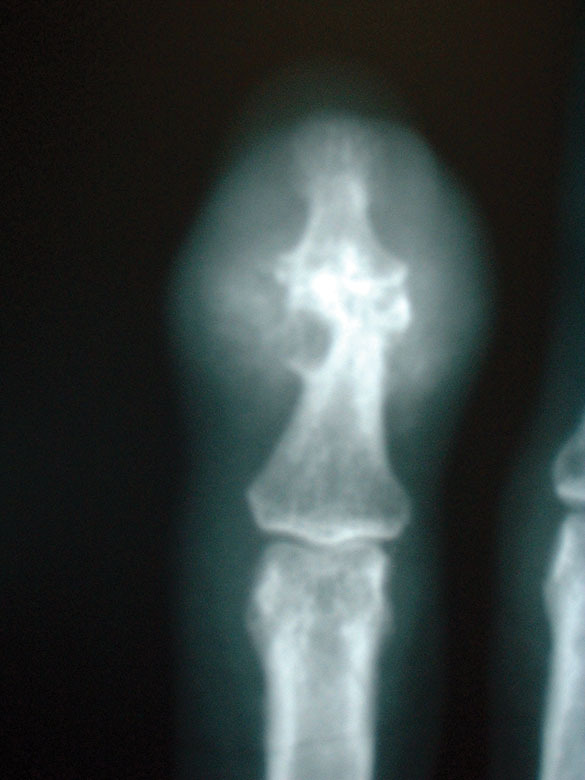 Uric acid does not show up on X-rays, but bone erosions at the end joint (DIP joint) are characteristic of gout (see Figure 2). Over time, both disorders can show more advanced arthritic changes. Attacks of gout and pseudogout can recur. When the episodes are infrequent, an NSAID or colchicine can be used as needed for flare-ups. If the epi-sodes occur more frequently, other types of medications are often indicated. The specific type of medication is best decided by your primary care physician and/or a rheumatologist. 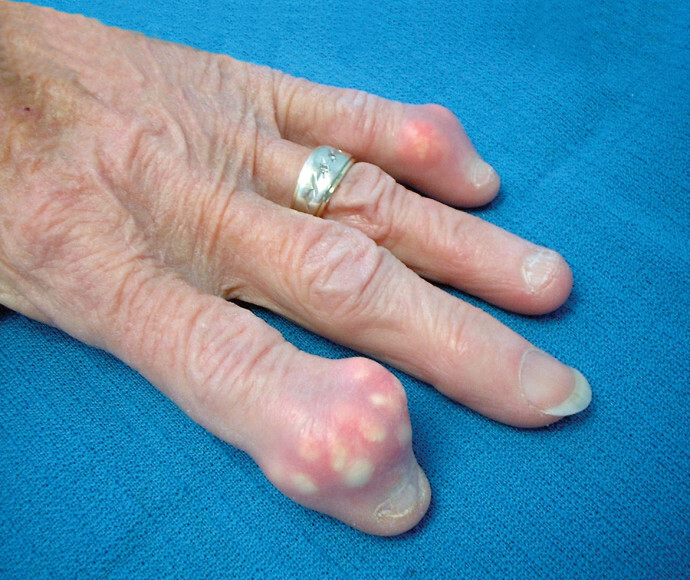 Patients with gout may need agents that decrease the production of uric acid, such as allopurinol. Figure 2: X-ray of finger with longstanding gout. Erosions are present in the bone at the end joint as well as swelling of the soft tissue.